Highest rated event in recent years in Peru. Will take place from March 27 – 31 at Señoritas, Puta Hermosa. Pictured: Event poster for the Claro Open Pro – Copa Tubos QS 3,000 from March 27 – 31 at the lefthand pointbreak of Señoritas in Punta Hermosa. 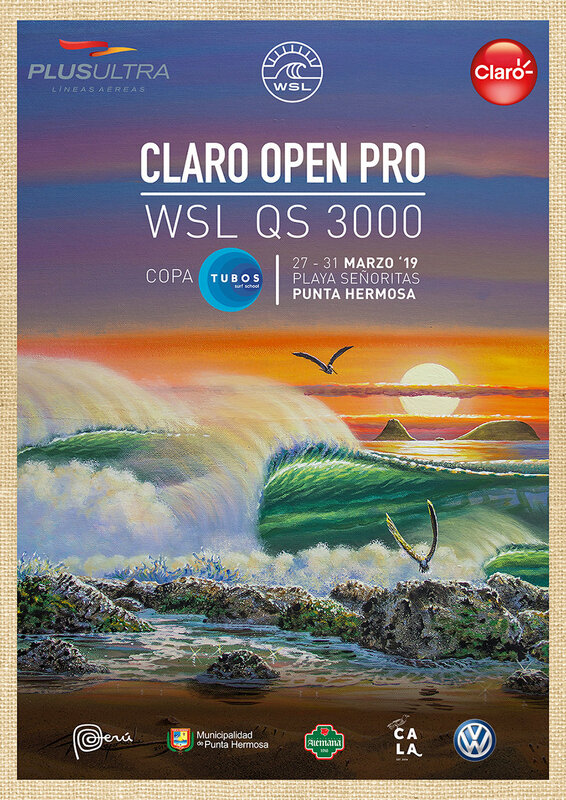 SEÑORITAS, PUNTA HERMOSA, PERU (Friday, March 15, 2019) – The World Surf League (WSL) is pleased to announce that Peru will be hosting the inaugural Claro Open Pro – Copa Tubos QS 3,000 from March 27 – 31 at the lefthand pointbreak of Señoritas in Punta Hermosa. Over 120 surfers from 21 different countries have entered in the event will be battling it out over crucial rankings points. With such a rich surfing heritage and epic world-class waves, Peru currently has some of the best up-and-coming surfers in South America on the Qualifying Series (QS) including Miguel and Tomas Tudela, Alonso Correa, Lucca Mesinas, Jhonny Guerrero, Gabriel Villaran, Cristobal de Col and Adrian Garcia. Each one would like to follow in the footsteps of the 2004 WSL World Champion Sofia Mulanovich, and events like this in their backyard provide huge support to the local surfers. Pictured: Cristobal de Col (PER). “We fully support these types of initiatives because we also share the same passion for surfing and the Claro Open Pro – Copa Tubos QS 3,00 will be a great opportunity for the Peruvians to show their talent on an international platform,” Espinosa said. “We wish all of our athletes the best of luck and hope they can win at home. We want to invite everyone to come down to the beach and show their support for our local heroes!” declared Baca. The first QS event of the year in South America was the QS 6,000 Hang Loose Pro Contest in Fernando de Noronha and saw Jadson André (BRA) take an emotional victory over high-flyer Yago Dora (BRA). With a strengthened 2019 calendar, Men’s and Women’s athletes will have plenty of opportunities to earn ranking points without leaving the continent. Events will take place in Brazil, Peru, Chile and Argentina. Showcasing the world’s best surfing on its digital platform at WorldSurfLeague.com, the WSL has a passionate global fan base with millions tuning in to see world-class athletes like Kelly Slater, Stephanie Gilmore, Tyler Wright, John Florence, Lakey Peterson, Paige Alms, Kai Lenny, Carissa Moore, Gabriel Medina, Courtney Conlogue, Mateus Herdy, Kirra Pinkerton, Steve Sawyer, Soleil Errico and more battle on the most dynamic field of play of any global sport. This entry was posted in Adventure, Global News, Highlights, Surf, Water by admin. Bookmark the permalink.